When I first heard of Pasta Chips, I was definitely intrigued! I love pasta, so I knew I would like Pasta Chips. Plus, I am all about new flavors..and with these, I get some great new ones to try, like, Marinara and Alfredo! The chips I expected to be hard, like a dry piece of pasta, were not at all! They are crunchy, like a cracker, and delicious! Pasta Chips are made with semolina flour and Italian herbs. 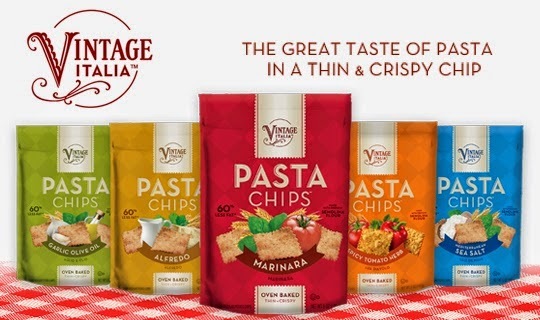 We’ve married this Tuscan inspired chip with different seasonings based on regional Italian favorites, steeped in hundreds of years of Italian culture and living. Alfredo- The creamy, buttery flavors of alfredo sauce blend so nicely when parmigiano-reggiano is sprinkled in, making a decadent flavor to pair with the crunchiness of Pasta Chips. Marinara- Marinara sauce brings the classic flavors of Italy into one reminiscent taste. 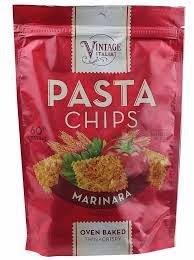 Everyone has a secret family marinara recipe that was passed down in the family, and we’ve included ours on these chips! Garlic Olive Oil- Garlic and olive oil are the ultimate romantic duo; letting garlic simmer in olive oil creates a delicious aroma that wafts throughout the kitchen. Go ahead, open the bag and let the memories flow. Mediterranean Sea Salt- Puglia is located at the heel of the “boot” and this is where the largest salt flat in Europe is located. Simply seasoning with sea salt makes it easy for you to pair with your favorite dip! Spicy Tomato Herb- Being located at the tip of the “boot”, it’s no wonder Calabria decided to add a little “kick” to the classic marinara flavor. Spice up your day with some arrabiata inspired chips! I would definitely recommend these chips to anyone who loves pasta..they are crunchy, the flavors are perfect and they are very satisfying!